Many pet parents struggle with the realization that their dog is getting older. But it’s important to recognize the signs of aging and take measures to ensure your dog’s quality of life doesn’t change. Here are some things you can do. Talk with your vet about the type of diet your dog needs. Your vet can make recommendations about quality brands, ingredients or special formulas your senior dog needs to thrive. For more information about diet, visit Petfinder’s Dog Nutrition articles. Your dog may be slowing down but that doesn’t mean he should spend his days curled up on the couch. Exercise is critical to keeping your dog healthy, both physically and mentally. Your dog may not be able to go on long hikes with you but shorter, less strenuous walks will keep him feeling good. 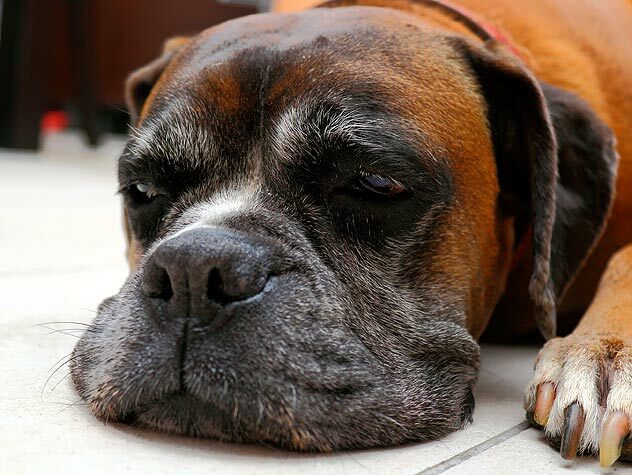 Extra pounds on older dogs means more stress on their body, including joints and internal organs. If you feel your dog needs to shed a few pounds, talk with your veterinarian about a weight loss and exercise plan. A lot can happen in between vet visits. The American Animal Hospital Association recommends senior dogs see their vets at least every six months for a check up. Many diseases and health issues, if caught early enough, can be treated. In his book, Your Dog: The Owner’s Manual (Grand Central Life & Style, 2011), Dr. Marty Becker suggests asking your vet about common issues specific to your dog’s breed, like predisposition to kidney problems, diabetes or severe arthritis. Find out what the early warning signs might be so you can be on the lookout. This is also a good time to talk about your dog’s diet and exercise routine as well. Regular dental care is important throughout your pet’s life but especially for seniors. Dr. Fred Metzger, veterinarian and contributor to the Caring For Your Senior Dog report, says, “older dogs and cats with neglected teeth are time bombs ticking.” The report explains how tartar build up can cause gingivitis, which can cause bacteria to get into the bloodstream, wreaking havoc on your dog’s organs. A great way to contribute to your senior dog’s good health is to keep his teeth and gums in tip top shape with regular at-home brushing and yearly professional cleanings by your vet. As they age, our dogs need our care and attention even more. It’s up to us to monitor their health and take measures to keep our pets as healthy and happy as possible in their senior years.